May 2004 Newsletter May 19, 2004: The Stow Town Meeting unanimously passed Article 44, to spend $14,667 for the town's share of a 1998 federal and state grant to secure the right of way for some of Stow's portion of the Assabet River Rail Trail (ARRT). The easement will be for 7,100 linear feet of the original right of way, including 1,300 feet of Assabet riverfront, for a total 21 acres. This is the first trail ROW acquisition in Stow and all the ARRT supporters in Stow are to be congratulated. 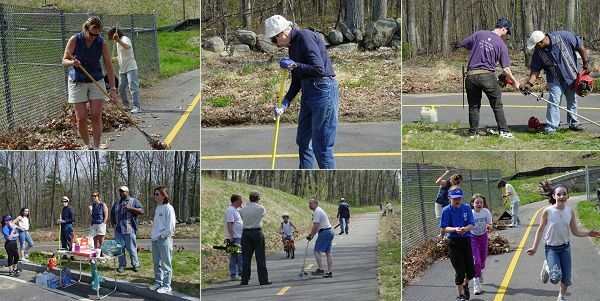 May 1, 2004: Thanks to Intel, Hope Worldwide-New England and other volunteers the open sections of trail in Marlborough are in great shape for Spring, and brush has been cleared from the overlook of the Fort Meadow Reservoir. And thanks also to the Forestry Department of the Marlborough DPW for taking away brush and providing grass cutting equipment for the May 1 cleanup. 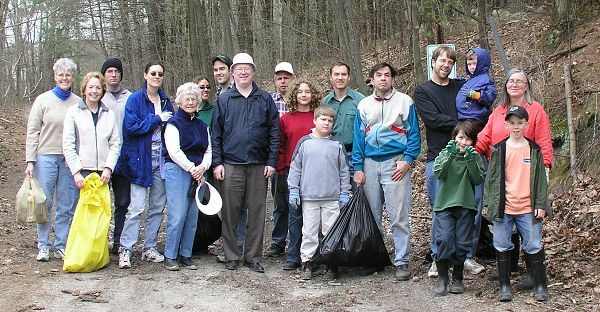 April 25, 2004: ARRT sponsored an Earth Day cleanup of the Maynard ROW. 21 Volunteers picked up trash on the proposed trail. On May 15th, we'll be back and spreading 1000' of wood chips between the rails, to make an interim walking path between Sudbury Road and Route 117.